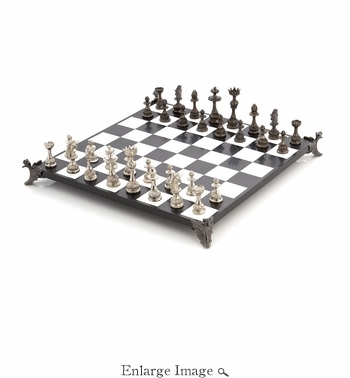 The Michael Aram Special Edition Chess Set is the first gaming piece made by the artist. His love of nature and antiques workmanship served as the inspiration to create what he considers a 'medieval floral fantasy' motif – unicorns with petal manes and king protea flowers abstracted to represent the "King". "It's interesting how various flower sculpts have taken on the 'personality' of the traditional chess icons. I plan to continue onwards to design more game sets in the future."